NEW YORK, Dec. 6, 2017 – People feel increasingly polarized by unrest, upheaval and other changes taking place in the world, and more than 60 percent of adults globally say they feel overwhelmed by things happening around them. Ford’s 2018 Looking Further with Ford Trends Report examines not only the issues dividing the world, but also the coping mechanisms that are emerging as a result. 1. The Edge of Reason: Global upheaval is evident in everything from politics to pop culture, and people are responding to these changes in polarized fashion. As divisiveness grows, a sense of being overwhelmed intensifies. Consumers are hungry for inventive ways to cope and adapt. 2. The Activist Awakening: This culture of polarization means consumers are being jolted out of complacency. Conventional wisdom and expectations are being toppled as individuals debate the change we need. 3. Minding the Gap: Worldwide, the spotlight is on inequality. Activists and entrepreneurs are experimenting with new ways to improve access to quality education, increase productive employment, close wage gaps, and provide everyone with affordable access to basic living standards and infrastructure. 4. The Compassionate Conscience: With an omnipresent news cycle, we are more aware than ever of the challenges consumers face around the world. People are becoming more reflective of their roles in society and more focused on how they can be more engaged. 5. Mending the Mind: Consumers and institutions are realizing that you cannot have a healthy body unless you have a healthy mind. As such, mental health and well-being are moving to the forefront for individuals, governments and companies to address. 6. Retail Therapy: Many consumers are on an endless hunt for something new and different – seeking material goods or experiences that bring happiness. As services aiming to provide efficiency experiences proliferate, consumers now find they can buy the one thing that was never for sale – time. 7. Helplessly Exposed: Big Data claims to be able to interpret our behaviors, which in theory should help consumers. But with Big Data can come Big Bias, and once personal information is relinquished, all consumers can do is hope companies use it responsibly. 8. Technology’s Tipping Point: Virtual reality, artificial intelligence and autonomous technology – long far-fetched notions – are now being incorporated into our daily lives. Worldwide, humans are wondering what the onslaught of intelligent technology will mean for society. 9. Singled Out: Are marriage and parenthood still the desired norms for happy living? Couples today – with more choices and longer life spans to consider – are rethinking commitment and fulfillment. 10. Big Plans for Big Cities: By 2050, nearly 75 percent of the world’s population is expected to live in urban areas. To capitalize on the full potential of cities – ensuring they are happy and healthy places in which to thrive – we must smartly plan for transportation, employment, housing, wellness initiatives and an infrastructure that can accommodate booming populations. 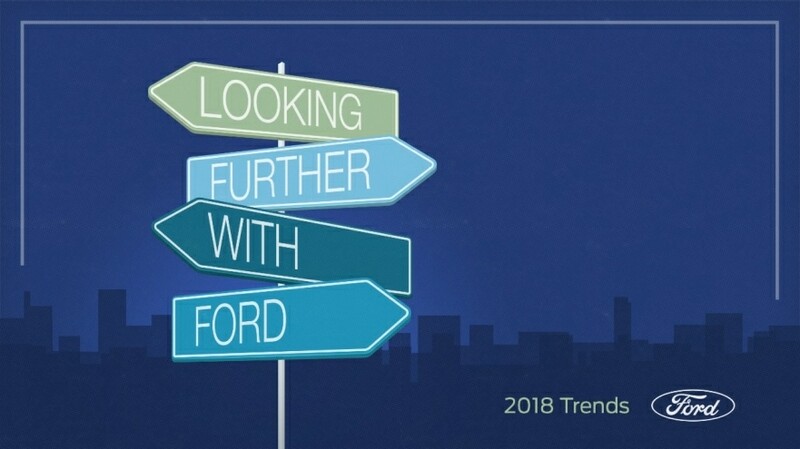 For the full Looking Further with Ford 2018 Trends Report, please visit www.fordtrends.com.